Earlier this week, Secretary and former CEO John Bryson made his first trip to Detroit, as Commerce Secretary, where he met with representatives from nearly every major auto maker that produces cars in the United States. In addition, Bryson met with United Auto Workers (UAW) President Bob King, Michigan Governor Rick Snyder, Detroit Mayor Dave Bing, as well as members of the Michigan Congressional delegation. The trip came on the heels of President Obama’s announcement late last year naming Secretary Bryson as co-chair of the White House Office of Manufacturing Policy. Secretary Bryson’s day-long trip began with a breakfast meeting with members of the Michigan Congressional delegation including Senator Debbie Stabenow, Representatives John Dingell, John Conyers and Hansen Clarke. The group discussed a wide variety of topics including what the Federal government can do to further support the Nation’s manufacturing sector and automotive industry. Secretary Bryson reiterated that the Department of Commerce is focused on doing everything possible to help support manufacturers. He also talked about the various services at the Commerce Department that are available everyday to manufacturers large and small. For example, the Commerce Department’s International Trade Administration helps promote the U.S. auto industry through trade missions, trade shows and buying missions in addition to conducting market research and business matchmaking to U.S. exporters, particularly to new-to-export and new-to-market automotive suppliers. Following the breakfast meeting, Secretary Bryson hit the auto show floor and first met with GM CEO Dan Akerson at the Cadillac exhibit. Mr. Akerson showed Secretary Bryson and members of the Michigan Congressional delegation the newest Cadillac CTS. After that, the group walked over to the 2013 Chevy Malibu exhibit where Mr. Akerson showed the group Chevy’s newest midsized sedan. They also ran into Detroit Mayor Dave Bing who was also checking out the latest GM vehicles. Secretary Bryson then visited with Chrysler/Fiat CEO Sergio Marchionne and saw the new Dodge Dart. 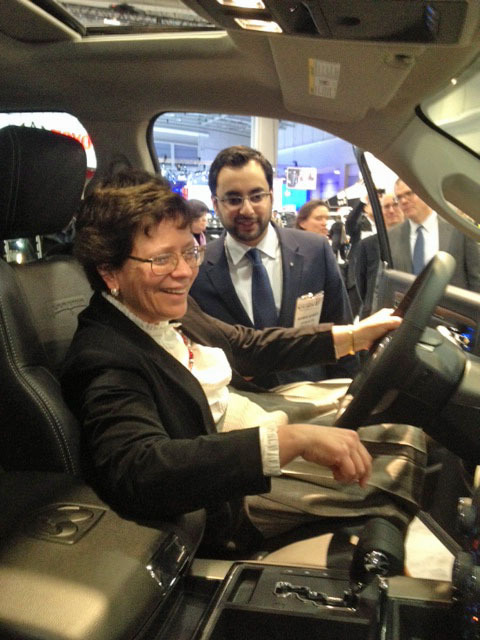 Both Secretary Bryson and Senator Stabenow took turns in the driver’s seat while Mr. Marchionne pointed out the features of the Chrysler’s newest compact sedan. Secretary Bryson’s final stop on the floor was with Ford Chairman Bill Ford, where he saw the new 2013 Ford Fusion, which will include three engine options, including a hybrid and a plug-in hybrid version. 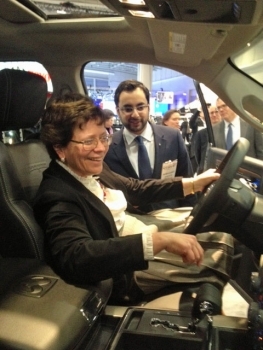 The Ford Chairman also showed the Secretary the new Lincoln MKS, before the pair ran into Michigan Governor Rick Snyder who was also checking out the newest Fusion. The three briefly chatted about the importance of manufacturing and the auto industry to the state. The Secretary then left the show floor to meet with UAW President Bob King. The two discussed how the Commerce Department can ensure that they are doing everything they can to support American manufacturing so that companies build their products here and sell them everywhere. The Secretary’s final meeting was with the Global Automakers, a group that represents members of the international automakers community, including companies from Japan, Germany, and other countries around the world. Secretary Bryson talked about how foreign direct investment in the United States is one of his top priorities, and members of the group discussed the investments they had made to create jobs here at home. Overall it was a quick, but productive trip to Michigan, where the Secretary met with business, and political leaders, and discussed what more the Department of Commerce can do to support job creation here at home – and saw some great cars.